Whole Milk is defined as milk from which no fat has been removed. 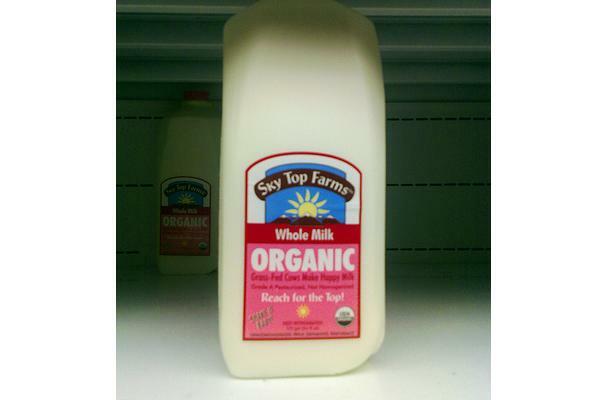 Whole milk is considered a complete food. The milk fat found in whole milk contains glycosphingolipids , which are fats that encourage cell metabolism, growth and fight gastrointestinal infections. Milk is rich in Calcium and Vitamins A & D.
Choosing: Always check the expiration date when purchasing whole milk. Procuring: Milk is produced by mammary glands of mammals. . Milk consumed by humans are usually from cattle, goats and sheep. Milk and milk products are processed in dairy facilities. Examples of milk products are cream, butter and cheese. Cleaning: Milk undergoes pasteurisation to kill harmful microorganisms by heating the milk for a short time and then cooled. Pasteurisation is used to kill harmful microorganisms by heating the milk for a short time and then cooling it for storage and transportation. Pasteurised milk is still perishable and must be stored col by both suppliers and consumers. Dairies print expiration dates on each container after which stored will remove any unsold milk from their shelves. History: Animal milk is first known to have been used for human consumption during the Secondary Products Revolution, around 5000 B.C. It is assumed that when animals such as cattle were first domesticated, it was only for meat purposes. Just making my first mail at indianratatouille.wordpress.com, which seems to be a wonderful forum!